Rehabilitating Stockhausen with a KLANG: Does less mystique enhance his stature? Stockhausen’s KLANG at Philadelphia’s FringeArts: An industrial-studio-space performance of one of many trios. Karlheinz Stockhausen has only been gone a little over ten years, but the infamous, trailblazing composer (1928-2007) seems like a name from the past, provoking as much suspicion as awe with music that seems purposefully opaque – one smoke screen after another, with the core being hard to locate, much less understand. At least in the U.S.
That’s why the two days of Stockhausen’s KLANG at Philadelphia’s FringeArts could be the start of a turning point in Stockhausen’s presence here. The first problem with his output is where to start. And the enterprising producer Elizabeth Huston started at the end: KLANG (which means “sound” ) was Stockhausen’s last major work, ostensibly a cycle of pieces that correspond to each hour of the day, their collective purpose being to ease listeners into the afterlife. The idea was to get us used to not having bodies so we won’t be confused at the point of death and take the wrong white-light tunnel. Yes, like the Tibetan Book of the Dead – but with a vast and complicated cosmology involving billions of alternative universes. (Even at the end, Stockhausen wasn’t taking it easy.) Left unfinished at the composer’s death, KLANG touches base with 21 of the day’s 24 hours, though the individual pieces do not occupy an entire hour, and sometimes quite a lot less. In Philadelphia, both April 7 and 8 had some 14 hours of KLANG each day. That’s a lot of anything to take in, much less Stockhausen. In producing this event, the ever-ambitious Huston (who previously put each of Berio’s Sequenzas in a room decorated according to the decade in which it was written) had great collaborators in Ensemble Musikfabrik, who are old hands at Stockhausen, plus some Philadelphia performers who were just as authoritative. With scholars such as Joseph Drew and Thomas Patteson giving periodic talks between performances, KLANG slowly shed its mystique in ways that could help illuminate other works in the composer’s vast output. But it may have also been a sort of Wizard of Oz moment, in which Stockhausen emerges from his firebrand persona, revealed as a “man behind the curtain” who was simply writings mountains of chamber music and slapping enigmatic titles on it. As Drew revealed in one of the lectures, Stockhausen never read the whole of The Urantia Book, which is sort of a sci-fi version of The Bible. Drew also points out that the composer always maintained remnants of the Catholicism he grew up with in Germany. All of this may come as a surprise to those who think of Stockhausen as the rock-star space voyager of modern music. He employed mysticism, but maybe he didn’t entirely subscribe to it. The music itself is sometimes aging strangely. Though Stockhausen and Pierre Boulez were the twin deities of Europe’s post-World War II avant-garde, Boulez’s complicated compositional systems came with a coloristic sensibility directly descended from Ravel. By contrast, Stockhausen can seem dense and obscure. Or so it seemed a few years ago when the New York Philharmonic performed Stockhausen’s Gruppen, written for three orchestras and leaving so much of its content buried within itself that the piece was perhaps better appreciated when read on the page than when actually heard. What’s more, in the last decades of his life, Stockhausen pushed himself into obscurity by buying his entire Deutsche Grammophon discography and making his music extremely hard to get (mail-order only, at exorbitant prices). 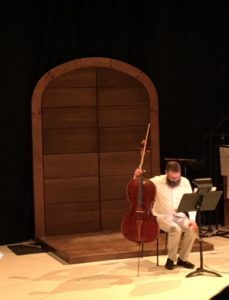 I approached KLANG in the spirit of a Gray Line tour: Since it’s a cycle of smaller pieces rather than a cohesive whole, I felt okay about giving it six hours (just as I would for Parsifal); I was not going to be a Stockhausen martyr. And frankly, I feared walking into some sort of a musical dungeon. Some people, I’m sure, stayed for all 14 hours (one guy I talked to had come in from Chicago just for this event), but I saw others coming and going. 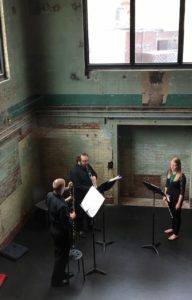 As I arrived at the FringeArts headquarters – a converted water-pumping station – on Saturday morning, the KLANG-a-thon was underway with HOFFNUNG for violin, viola and cello; it proved to be stimulating, charming, and not even baffling. The music itself is some of the more cohesive Stockhausen I’ve heard. Though these chamber works often seem longer than their actual content would warrant, there was always something in there that reflected a great musical mind at work – and, often, a stroke of theatricality at the end. HOFFNUNG concluded with one of the musicians playing a series of loud, stabbing notes while walking out of the room. In three installments of Naturliche Dauren (a series of etude-like miniatures for solo piano), Christopher Oldfather donned a single glove with several jingle bells sewn onto it, tinkling randomly as his hand executed the pianistic challenges. A doorway in the middle of the FringeArts stage consisted of several different panels, giving off different pitches when played like drums. I have notes saying one instrument was played with a wooden spoon. This was more of a play room than a dungeon. Other extended techniques were at a minimum. The electronic tracks in many of the pieces always had a strong sense of purpose and musical progression. Just because Stockhausen wanted us to be thinking about an existence without our bodies didn’t mean he was writing music that would show us the way. One looks in vain for any descriptive effects. Of course he didn’t go there; Stockhausen wouldn’t write anything so traditional. He was of the generation that needed to constantly reinvent the wheel. Revisiting some of these pieces (as well as some that I missed) on YouTube has only confirmed these conclusions. The thought I kept coming back to was that that Stockhausen was simply writing music: his titles and philosophical underpinning may not get you very far in the comprehension department. Paradis, the piece for flute and electronics that commemorates the 21st hour, might suggest that Stockhausen was conveying his vision of paradise. After hearing the piece, I think he was simply writing an engaging work for wide-ranging solo flute with a busy electronic accompaniment vaguely suggesting swarms of insects. This was not music on a higher plane than the rest, it’s just what he was intuitively drawn to at that point in the cycle. Many of the pieces had pre-recorded voices saying various religious aphorisms – nice, but it didn’t get me any closer to heaven. Many of the trios are based on the same tone row, but knowing that didn’t create any greater sense of unity. I’m not being contrary here, but simply defining a playing field that creates the right kinds of expectations. And here’s where Stockhausen might want to slug me, were he still alive: Is it possible that these individual pieces could be reasonably programmed on any chamber music concert alongside Beethoven? I think so. In fact, I hope so! But it did. And I emerged without brain damage. And maybe with more gray matter than when I walked in. Thanks for this. Good piece.